Welcome to another special edition tutorial! Once again today I’m traveling to East Palestine, Ohio to join with Brenda Landsdowne from B’Sue Boutiques to film a new project tutorial for you. Brenda & Christi Friesen have joined together to create a new fun filled jewelry making group Bohemian Vibe. 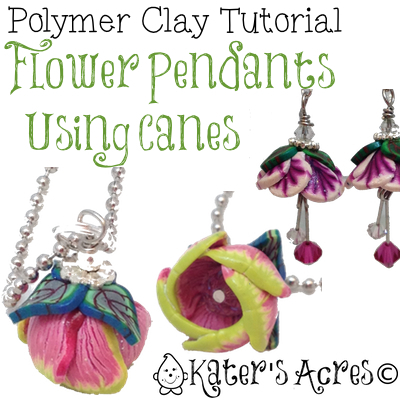 These pendants can be adapted to fit right into your Bohemian trend jewelry creations. And, yes, we’re making a smaller version in earring form too. If you missed my Flower Pod Tutorial with B’Sue Boutiques, get it here. You can make this project from any cane you have, just shape it into a petal shape and assemble according to the video below. If you’d like to make a cane like the ones shown on the video, you can get the free tutorial by clicking on the graphic below. It will take you approximately 20 minutes from beginning to end to make this cane (not including rest time). Click on either picture to get your FREE tutorials.